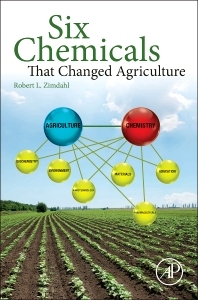 Six Chemicals That Changed Agriculture is a scientific look at how the chemicals used in today's food production were developed, evaluated, and came to be in wide-spread use. From fertilizers to pest management, antibiotics to DNA, chemicals have transformed the way our food is grown, protected, and processed. Agriculture is the world's most important environment interaction, the essential human activity, and an increasingly controversial activity because of its use and presumed misuse of chemistry. The major characteristics of US agriculture for at least the last six decades have been rising productivity, declining number of mid-size farms, increasing farm size, an increasing percentage of farm production on fewer, large farms, increasing dependence of chemical technology and more developmental research being done by the agricultural chemical industry rather than by independent land-grant universities. Another equally important feature of modern agriculture is wide-spread suspicion of its technology by the public. The book will recount examples of this suspicion related to specific chemicals and present the essence of the suspicion and its results. Robert L. Zimdahl is a Professor of Weed Science at Colorado State University. He received his Ph.D. in Agronomy from Oregon State University. Among his many honors and awards, Dr. Zimdahl was elected a Fellow of the Weed Science Society of America in 1986 and currently serves as editor of that society’s journal, Weed Science. He has been a member of several international task forces and has authored a number of books and articles on the subject of weed science.